The horses listed below are looking for foster homes where they can stay either temporarily, or until new homes are found, (depending on the length of time the foster would like to care for them). Some are already ready for new homes, some need a bit more rehab (the horses' listings will specify). If you are looking for a companion for a horse you already have but don't want to make the commitment to buy and own another horse, we are also open to free-leasing some of the horses listed below. Call or email us for more information. 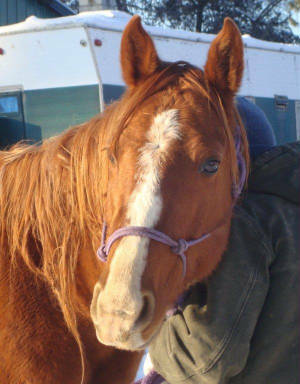 We've decided to just keep the old girl here, with us:Mazey: 20+ year QH mare. Mazey is a sweet old girl who loves to be brushed. She was quite thin when we bought her but has gained a ton of weight the last few months and is shedding out a deep, golden palomino (new pics coming soon!). Mazey is halterbroke and has a good disposition. She did allow a rider to ride her around the yard here but we think it's been many, many years since she was ridden and she would be best suited/happiest as just a companion horse. Mazey does need to be grained twice a day to maintain her weight but has no other health concerns. 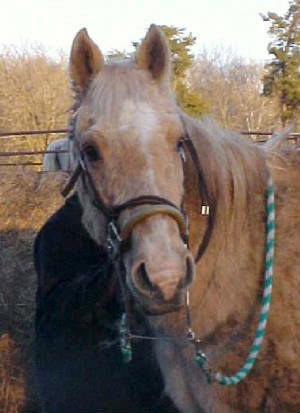 More info/pics on "rescue horses" page. She found a wonderful home. HHP Senorita: 1988 registered Saddlebred mare. Rita would make an excellent companion to a lonely horse. 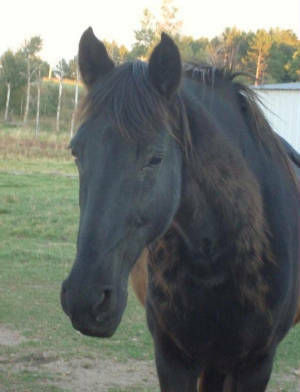 She is a nice older mare and is easy to work with. Rita was a "career broodmare" and was never broke to ride. More info on the "horses for sale" page. Jez is currently being fostered by our friends, Ash and Kelly. She is being started under saddle.